One of the primary benefits of the smart grid is to provide the data necessary to drive energy efficiency improvements. Energy efficiency is the cheapest method of providing Americans with electricity. Energy efficiency programs aimed at reducing energy waste cost utilities only about three cents per kilowatt hour, while generating the same amount of electricity from sources such as fossil fuels can cost two to three times more. Approximately 518,000 retrofit projects were completed through the Home Performance with ENERGY STAR program from 2002-2015, according to DOE. Add to that the roughly 75,000 homes retrofit through the Better Buildings Neighborhood Program and the total number of home performance retrofits completed through the leading program efforts approaches 700,000—less than 1% of US single-family homes. While this number doesn’t include retrofits completed outside of programs or those conducted through weatherization efforts targeted to low- and moderate-income households, it does illustrate the need to scale up retrofit activity to capture the energy savings available. Encouraging public buy-in and participation in programs. 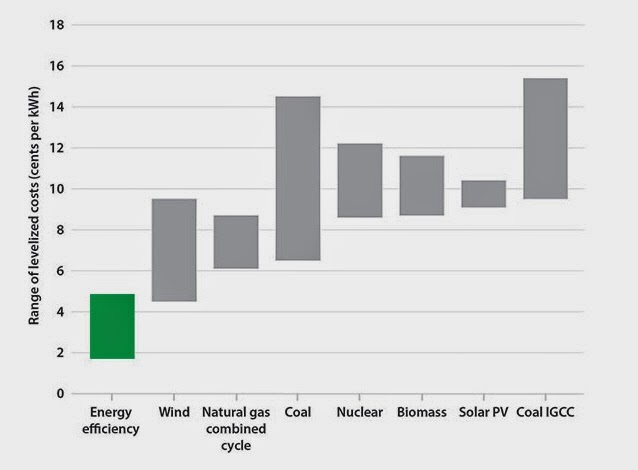 Efficiency can be the most cost effective utility investment, but it can be hard to measure. Smart Grid technology can ensure that efficiency investment is optimized and meet the need for accurate evaluation of program benefits. Building energy codes are one of the easiest and most cost efficient ways for states and local jurisdictions to implement energy management policies. Nine cities and two states in the U.S. have passed laws requiring the benchmarking & disclosure of energy use in buildings. More governments look to follow their lead, expecting these policies to drive investment in efficiency. Energy Efficiency and Renewable Energy investments pay back steady returns over many years, but often it is difficult for businesses and households to pay the upfront costs. Energy Upgrade California is a statewide energy management initiative designed to help residents and small businesses learn the best ways to take action on energy to save money and be more comfortable at home and at work. This new initiative will help our communities meet our energy efficiency and clean energy goals.